Mice were perfused with 2% paraformaldehyde in PBS and postfixed overnight in 2% paraformaldehyde. Brains kept at 4 degrees in PBS until sectioning on a vibratome (60 um). Sections stored at -20 degrees in antifreeze until IHC reaction. Antigen retrieval with 1% sodium borohydride for 20 min. Pre-incubation in 10% normal goat serum, 1% BSA, 0.3% TritonX-100 in PBS for 1 hr. Primary incubation in 1% normal goat serum, 1% BSA, 0.3% TritonX-100, plus primary antibody (1:2000) in PBS overnight at room temp. Rinse 3 x 10 min in PBS. Secondary incubation in same solution as primary (but with secondary antibody) for 90 min at room temp. Rinse 3 x 10 min in PBS. Mount with Vectashield with DAPI. 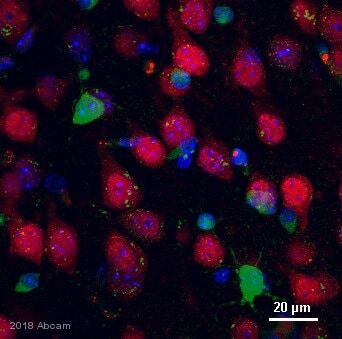 This antibody gave bright, low-background, specific labeling of neurons. Labeling intensity did decrease somewhat across the thickness of the tissue section, but it was still clearly visible in the center of the 60 micron section. In the image, green is GFP, red is NeuN, and blue is DAPI.